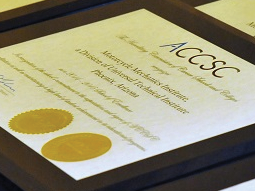 At its September 2009 Professional Development Conference, held in San Diego, California, the Accrediting Commission of Career Schools and Colleges (ACCSC) recognized three Triangle Tech schools located in Pittsburgh, PA, Greensburg, PA, and DuBois, PA as 2009 ACCSC School of Excellence recipients. Triangle Tech schools have a long history of recognition for delivering quality education. Triangle Tech, Erie, PA, received their second School of Distinction award in 2007. In 2005, Triangle Tech, Sunbury, PA, was awarded the School of Distinction. The 2004 School of Distinction Award from the Accrediting Commission of Career Schools and Colleges was awarded to Triangle Tech, Pittsburgh, PA; Triangle Tech, Erie, PA; Triangle Tech, Greensburg, PA; and Triangle Tech, DuBois, PA.